The Big Bang is not a complete theory of creation as it leaves too many observations unexplained. The real world is very complex. The moon rocks and moon dust brought back from the moon by the Apollo 11 astronauts has really complicated things. Tests have shown that some of the moon rocks are older than the earth rocks. So the moon is older than the earth? Science cannot explain that. Then it gets worse. One sample of moon dust is a billion years older than the moon rocks. But rocks disintegrate to form dust. So the rocks should be older than the dust. But on the moon it is the opposite way around. Science is baffled and has no answers. Apollo 11 rocks and dust were dated by 9 different laboratories chosen for respected scientists. They listed 116 radioactive dates from these samples. The 116 moon rock and dust specimen datings produced ages ranging from 40 million to 8.2 billion years. 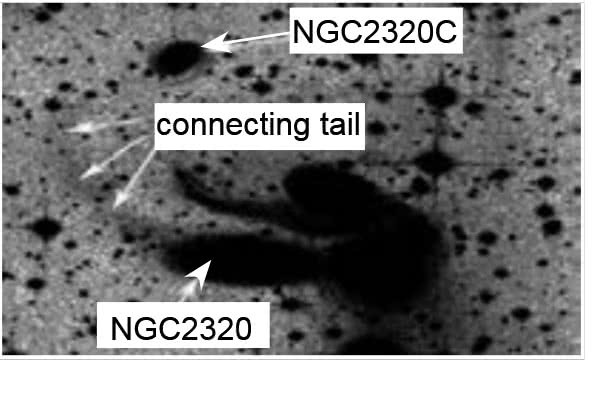 This is typical of radioactive dating. A huge range of values, and just take your pick. The age of the same rock measured by different scientists using different techniques varied widely. Rock Sample 10017 had dates from less than 250 million years to 4.67 billion years. Five different sources came up with 19 different results. Sample 10069 had soil 4,9 billion years compared to the whole rock which was 2 billion years younger at 2.9 billion years. 95 % of our universe seems to be made up of invisible Dark Energy and Dark Matter. But none of that is explained or predicted by the Big Bang. So the Big Bang theory cannot explain 95 % of the universe. So what is the real value of the Big Bang theory. Obviously, not much. :21 Which some professing have erred concerning the faith. Grace be with thee. Amen. If science theories contradict Scripture then they are simply vain babblings and not true science. Science wants to dethrone God as the Creator, but science cannot explain the facts of creation. But science had led a lot of people away from God, where they face an empty eternity on their journey to nowhere good. Human theories that try to explain our strange and very complex universe are just too simple. There are always unexplained results that we keep on discovering that just do not fit into our existing ideas. We are normally aware of three states of matter: solids, liquids and gases. But flat plasma TV screens remind us that there is a fourth state of matter called plasma, which has the negative outer electrons separated from the rest of the atom which thus is left with a positive charge. Space is full of plasma which gives rise to vast observed spiralling magnetic fields and intergalactic magnetic filaments. Hans Alfven was awarded the Nobel Prize for his research and observations of these huge plasma fields in deep space. The Big Bang theory was developed without considering these plasma fields. This led to the writing of the book "The Big Bang Never Happened". The Big Bang cannot describe the origin of the universe because it leaves out the plasma state which plays a significant role in the makeup of the universe. The most basic law in Physics is the Law of the Conservation of Energy. This states that energy cannot be created or destroyed. It can only be transferred from one system to another. No experiment has ever been done that contradicts this Law. But the Big Bang claims that all the energy in the universe was created at the beginning in one explosion. As you can see, this is a complete contradiction of the Law of Conservation of Energy. So the Big Bang starts with a false theory. Do not let scientists bluff you. No one even knows what energy is. It is completely invisible and we are only aware of it by its effects on visible matter. Since we do not know what energy is, we certainly do not know what created it. To say it was formed in a big explosion is just a complete guess that is not confirmed by any experiment. Explosions today do not create energy, they merely rapidly release the energy that was stored up in the chemicals of the explosive. We also do not know what time is. So to claim that time was created in the Big Bang is a complete guess as we know of no way of creating time. The universe is analysed in terms of Einstein's 10 gravitational field equations that describe how matter distorts space and time. This bending of space-time then tells matter how it must move. But the equations are too complicated to solve. So big guesses are made to simplify the equations. The galaxies are all regarded as if they are tiny, tiny gas molecules that are free to move completely randomly. Just as gas molecules spread out evenly in all directions, so the galaxies are assumed to spread out evenly in all directions with no real clustering together anywhere. Then the equations can be solved to describe our universe. But this is not what we observe. Astronomers looked deep into space and discovered a Big Wall of galaxies that are clumped together. With the Sloane telescope on a satellite, they looked further into space and saw an even bigger 1,38 billion light year Sloane Wall of clumped-together galaxies. Now they have spotted a big empty space called the Big Void which is about a billion light years in size. Then further out they spotted the even bigger supergiant Huge-Large Quasar Group that measures 4 billion light years in length. So as their telescopes get bigger and better, the astronomers seem to discover bigger and bigger galactic clusters. In 2013 the Hercules-Corona Borealis Great Wall was discovered that is between 6 and 10 billion light years long. It consists of billions of galaxies that are clumped together. But the Cosmological Principle states that galaxies are spread out evenly in all directions. But this is clearly contradicted by these massive Walls and the huge Big Void. So the guesses they took to simplify Einstein's equations are not valid. Thus their calculations cannot be right. Scientists are thus in a predicament where their mathematics is not sufficiently advanced to solve the equations when they are applied to a non-uniform universe, which is what we are observing. Thus we cannot trust their conclusions. Between the constellations Centaur and Vela is a largely blank patch of empty space. In 2008 astronomer Sasha Kashlinsky discovered 800 different clusters of galaxies that are rushing towards this empty space at a breakneck speed of 100 kilometers per second. Further investigation revealed that there are actually 1400 clusters of galaxies in this Dark Flow. But things are meant to be the same everywhere, with galaxies ambling around in unremarkable ways. No group of galaxy clusters should be speeding through the universe as if they are late for an appointment. And what is attracting them? It must be incredibly huge. But we can see nothing in that empty space. So this oversized attractor must be over the edge of the visible universe. That means it formed very early in the history of the universe but then there would not have been enough time to form such a massive structure. And remember, the Cosmological Principle claims that things are meant to be the same everywhere. The central pillar of the Big Bang theory is that the Universe is the same in all directions. From this we get the Cosmological Principle that the Universe looks the same in every direction , wherever you are. We rely on uniformity for solving Einstein's equations. But there is no uniformity in these observations. The universe is getting more and more lumpy and less and less uniform as we look further out into space. The Dark Flow is a huge rush of galaxy clusters like the flow of a river. So things are far from uniform and homogeneous in our Universe. Our theories of how the universe formed in a Big Bang are thus wrong as they do not agree with the observations from deep space. A Russian scientist George Gamow stated that the Big Bang fireball would produce massive turbulence. During turbulence things move in complex and unpredictable ways. Turbulent flow in ocean and air currents makes weather prediction very difficult. After 5 days the weather has moved half way around the world and it is then too complex to analyse. Thus most forecasts do not go beyond 5 days. Nobel Prize winner Richard Feynman said that turbulence is the most important unsolved problem in classical physics. This problem is still unsolved. We still do not know how to solve the mathematical equations that describe turbulence. So when the scientists developed the equations to describe the first moments of the Big Bang they simply ignored the initial turbulence of that raging furnace of Big Bang energy. Once again, our inability to solve complex mathematics forces us to pretend that the explosion was reasonably uniform in all directions, which we know is not what really would have happened if there had been a massive explosion. In 1954 Vera Rubin did her PhD thesis which showed that the patterns of galactic motion in the universe implied turbulence at the beginning. The patterns of galactic motion were a good fit to Gamow's models of turbulence. Scientists, faced with this unwanted answer, could not question her being awarded a PhD for excellent research and observations but they simply ignored her results. It would be far more difficult to complete the Big Bang model if we tried to take turbulence into account. So turbulence got left out of the Big Bang theory. Consequently the Big Bang theory does not describe a real explosion. 6. Problems with the light elements lithium, beryllium and boron. None of these elements can be made in stars because the temperatures of even the coolest stars will destroy them. Beryllium and boron were not made in the Big Bang either, according to the scientists. Thus we are left to guess where they come from. But as Marcus Chown, renowned astronomy consultant for New Scientist, states on page 201 of his book "The Magic Furnace" that describes how atoms are made : "Mysteries still remain concerning the light elements". The Big Bang cannot solve this problem for us of how beryllium and boron formed. So their origin remains in the realm of unobserved speculation. But the Big Bang theory does include making helium and lithium from hydrogen. According to the Big Bang calculations about 23 % of the universe should be helium and this is what is observed in the stars. So the Big Bang can claim an accurate prediction in the amount of helium in the Universe. But when we turn to lithium, Michael Brooks in his book "At the Edge of Uncertainty" states on page 201 "We now know that the cosmos contains one third the amount of lithium-7 that the Big Bang theory says it should. We also know that there is too much lithium-6, which contains one less neutron in its nucleus. One thousand times too much, to be precise." So the Big Bang fails miserably to explain the origin of lithium. One thousand times too much lithium-6 is just hopelessly inaccurate. Explaining only how 33 % of the observed lithium-7 forms is also hopelessly inexact. Scientists believe that the galaxies have been around for thousands of millions of years. Astronomers calculated that the outer stars in a galaxy are moving much too fast. Over those vast time periods the fast moving outer stars would have broken away from the galaxy. 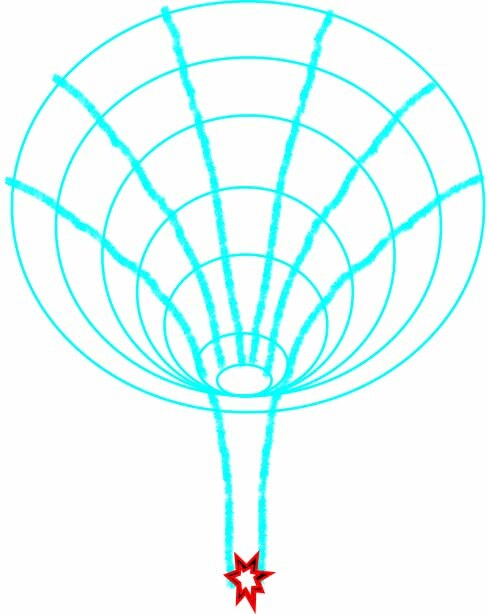 Fritz Zwicky in 1933 also measured clusters of galaxies that were spinning at speeds that meant they should be ripping themselves apart over very long time periods as their centrifugal forces that fling them outwards like a discus, would be able to overcome their gravitational attractions that hold them together. So scientists guessed that a ring of Dark Matter, made from unknown particles that we cannot see or interact with, surrounds each galaxy and keeps the outer stars in place. This Dark Matter must also surround each cluster of galaxies and hold the cluster together. Scientists however will not consider the possibility that this observation is evidence of a young universe. If the universe is not too old, then the fast spinning galaxies and clusters of galaxies have not been there for long enough for the outer fast-moving stars to break free. So now scientists are burdened with having to find an exotic Dark Matter that is completely unknown to us and we also have absolutely no idea what its source is. This Dark Matter has been calculated to form 22% of our universe so it is staggering that we have never yet found any of it. Then it gets worse. The Big Bang does not predict the presence of this Dark Matter. The Big Bang predicts hydrogen and helium accurately but makes a mess of lithium. But there is no place for exotic unknown particles of Dark Matter in the Universe as far as the Big Bang is concerned, so the Big Bang fails completely to explain the origin and quantity of Dark Matter. Imagine how much trouble they would save themselves if they believed in a young universe. Then no Dark Matter is needed. Scientists insist that the red shift in star light indicates the moving of stars away from us. Nobel Prize winner Steven Weinberg in his classic book "The First Three Minutes", which explains the Big Bang theory, states that we observe the red shift in starlight but we do not observe the stars moving away from us. This red shift could thus have a different cause and may even be due to some Physics effect that we as yet have not discovered. He also admits to a sense of unreality when scientists predict what happened as they get closer and closer to the moment of the Big Bang because we simply have no experience of the pressures and temperatures that would exist at those moments. We are thus speculating in the complete absence of experimental evidence. This is a brief summary of Professor Weinberg's comments that urge us to be careful about the conclusions that we draw. The red shift of starlight could be explained by other effects, like the Compton effect, where light collides with electrons in space and loses energy, and thus gets a longer or redder wavelength. The light from more distant stars undergoes more collisions and loses more energy and becoming redder. There is then no need for space to be expanding and thus there is no need for Dark Energy to cause this accelerated expansion. Remember, as the Physics Nobel Prize winner Leon Lederman stated, we have absolutely no physical evidence of what the Universe looked like just before the Big Bang. So whatever scientists claim about that moment, they are just guessing. If we go back to the beginning when there was nothing, then please remember that "nothing" cannot explode. Also remember, energy cannot be created. But believing that the red shift of starlight is an indication of star speed, the astronomers have now been saddled with an even bigger problem. Professor Steven Hawking used to assume that the universe spread out due to the Big Bang and then after a while this expansion would slow down as the galaxies inside the universe began to pull the outer galaxies back towards themselves. But recently measured red shifts indicated that the galaxies are actually accelerating faster and faster away from us, instead of slowing down. [ An explanation of what a red shift is will be shown at the end of the study]. So scientists now have to believe that empty space contains some exotic Dark Energy that is speeding up this expansion of the universe. What is Dark Energy? We have absolutely no idea. But to account for this observed acceleration of the expanding universe, there must be enough Dark Energy to occupy 74 % of the universe. Being "Dark" we cannot contact it in any way. The Big Bang theory does not in any way explain the origin of this Dark Energy. 22 % Dark Matter and 74 % Dark Energy adds up to 96 % of our universe that is "missing". The Big Bang, despite its other defects, cannot explain the origin of 96 % of our observable universe. So it is not enough to believe in a Big Bang origin of the universe. You have to believe in a Big Bang plus Dark Matter plus Dark Energy. 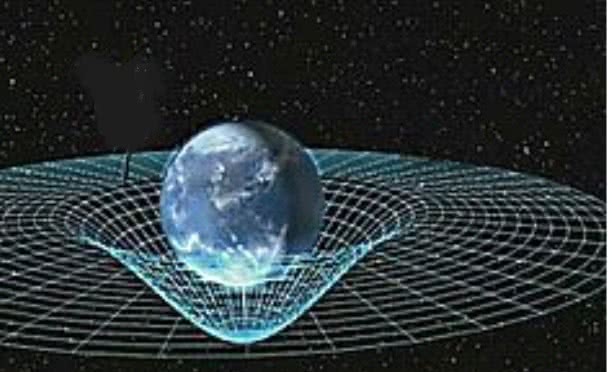 Einstein claimed that empty space consists of invisible "elastic sheets" of space-time. We do not really understand what these "sheets" are. But if a massive star or planet is placed on a "sheet" of space-time, it will dent the space-time in the same way that a person standing on a trampoline will dent the trampoline. The above picture from Wikipedia represents a large object like a planet as it dents and distorts the space-time that is around it. Stars are massively huge lumps of hydrogen gas. The gravitational force of all this gas crushes down onto the centre of the star where it fuses the hydrogen gas atoms together to make helium gas. In the process an enormous amount of energy is given out which opposes the gravitational force and stops the star from collapsing. But when this fusion reaction at the centre of the star stops, then the gravitational forces crush the star down to a very small, very dense lump of matter. If a star is 20 times bigger than our sun ( Our sun is 1,3 million times bigger than the earth ) then when the nuclear reaction at the centre of that star stops, its gravitational weight will crush this huge star down to a diameter of about 16 kilometers. All this mass, in such a small space, exerts such a strong attraction that nothing can escape from it, not even light. Because it absorbs light and does not give out light, we cannot see it. Thus we call it a black hole. We can picture the very small, very dense remains of the star making such a deep dent in the space-time "sheet" that it forms a funnel or hole. This picture shows the very compactly crushed, very dense "lump" which is the remains of a burnt out large star as it makes such a deep dent in the elastic "space-time sheet" that when we look at the "sheet" from above, it is as though there is a hole in the sheet. Nothing, not even light, can escape out of this "black hole". Everything that is close enough to its edge will fall into the black hole and will also be crushed. If the Earth was compressed down smaller than a one cent coin, it would start to form a black hole from which nothing, not even light energy could escape. A billion suns would have to be squashed down to about the size of our solar system to start forming a black hole from which nothing can escape. In theory, nothing that is inside this black hole can escape. If the star can be crushed to smaller and smaller sizes then its gravitational attraction becomes even bigger. If the mass of the collapsing star is bigger, then when it has collapsed, the gravitational force of the highly compressed "lump" will also be bigger. There are 100 thousand million stars in a galaxy. There are 100 thousand million galaxies in the universe. The Big Bang claims that all these stars from all these galaxies were once squashed together into a pin-point space that was much smaller than an atom. This is of course completely impossible. The scientists can not tell us how this compression happened. Assuming it did happen, we would have the ultimate black hole from which nothing could possibly escape. The Big Bang then claims that the entire universe escaped from this ultimate black hole in one instantaneous flash. This is simply impossible according to any known laws of Physics. Astronomer Stuart Clark says that current physics cannot describe the very beginning of the Big Bang because science cannot deal with the tiny fractions of time and space that would need to be considered if the universe was squeezed into a tiny dot, smaller than an atomic nucleus. Nothing can escape from this black hole as the gravitational attraction of the massive star causing the black hole simply pulls everything into it. Black holes are a brilliant concept and, if they exist, are the most extreme objects that exist out in space. They continue to challenge our understanding of the most fundamental laws of physics. The known laws of physics break down in the extreme conditions of a black hole. So it is difficult to know how far we can trust our calculations as we cannot, as yet, confirm our calculations by means of laboratory experiments. The pressures in a black hole are just too high for us to duplicate. By squashing the entire universe into the first tiny black hole, the scientists are creating a scenario which is so far beyond any physical experience that we can measure, that we could never trust their calculations. To try to justify this impossibility Alan Guth invented an inflationary force. No-one knows what this force is. No-one knows how it got switched on and off. No-one knows what happened to it when it got switched off. It existed only in the imagination of scientists in order to rescue the Big Bang from its flaws. The inflationary force switched on for the briefest fraction of a second. In less than a billionth of a second after the Big Bang started, this inflation force switched on for one hundred billion billion billion billion billionth of a second. This time scale is so unimaginably tiny that it is completely outside the ability of science to measure and thus it is simply a guess. Nothing realistically can switch on for such a short time. No scientist knows what the inflation force was and no scientist knows what switched it on and then off in such an unimaginably short time. This inflation force has never been repeated. Nor has the Big Bang ever been repeated in our universe. Good science is always repeatable. Thus the Big Bang and Inflation are not good science. But things get worse still. In that tiny, tiny fragment of time the entire universe ballooned out and increased its volume by, wait for it, one hundred billion billion billion billion billion billion billion billion times. This is not science fiction, this is seriously what scientists believe and the fact that the entire universe expanded far, far faster than the speed of light does not worry them either. It requires incredible faith to believe all this actually happened. Scientists thus do have faith. They believe in a miraculous beginning to the universe which somehow shattered all our known laws of Physics. Thus the Big Bang ceases to be Physics as we know it, and it becomes an alternative religion which cannot happen according to the natural laws of Science. Scientists just have faith that it somehow happened in a way that they cannot explain. But faith is the basis of religion. We cannot prove God exists as we cannot see Him. So we believe by faith that He exists. Religious people also believe that God somehow created the universe in a way that we cannot explain. So Science cannot condemn Christians for having faith in God because the scientists have to have incredible faith that all the impossibilities of the Big Bang somehow, miraculously happened. The only real difference is that Christians have faith in a personal God who can be spoken to in prayer and who tells us about Himself in the Bible. Scientists have this same faith but it is devoted to an impersonal event. A supernatural "explosion" that somehow produced space, time and energy. We have to call it supernatural because there are no natural laws of Science that can explain it. Even now it still gets worse. Energy produces matter and antimatter in equal amounts but when they collide with each other, both disappear in a flash of radiation. So a huge puzzle for scientists is why there is so much matter and so little antimatter. One theory is that if one billion particles of matter formed, then there would be one less particle of antimatter. So a billion particles of matter had to form before one particle could survive the antimatter onslaught. That simply means that the universe once had a billion times more matter than it has now. Imagine trying to squash a billion universes into a size that is smaller than an atom’s nucleus. The nucleus is about 100 000 times smaller than the atom. All of this is speculation because no-one was around to see it happen. Nor can anyone explain how all that matter and energy got compressed, nor how it all escaped the ultimate black hole at the beginning. In good science you must see and measure what went into the experiment, not guess what you think happened. So the Big Bang has not done a good job of explaining the origin of the universe. It is also not enough to believe in the Big Bang by itself. Scientists are forced to believe in the Big Bang and the Inflation Force and Dark Energy and Dark Matter. The Big Bang theory thus creates more problems than what it solves. There are three axes in the universe that is supposed to be uniform and have no axes. The Big Bang is not able to explain any of them, as the Big Bang demands uniformity in space. 10.1 Professor Joao Magueijo and Kate Land found what he called an Axis of Evil as the fluctuations in the microwave background are supposed to be random. They spotted a region where certain of the deviations lined up. More sensitive readings confirmed these findings that are causing real problems to the Cosmological Principle that space is uniform. 10.2 Astronomer John Webb found that a fundamental constant, called alpha, that determines how light interacts with electrons gets smaller when he looked at distant quasars ( very bright distant stars ) that are in the southern sky. When astronomer Julian King looked at quasars in the northern sky then the value of alpha got bigger than it should be. This Axis of Alpha seems to line up with Kashlinsky's Dark Flow. Because, according to these readings, alpha is not constant, it wrecks our known physics. Astronomer Michael Murphy calls this variation of alpha a violation of the laws of physics. There is obviously something about space that we do not understand. So do not be in a rush to believe scientific theories about space. 10.3 Spiral galaxies in space look like bicycle tyres which spin randomly either to the left or to the right. Astronomer Micheal Longo discovered that 7 % of the galaxies along a certain line had a left handed spin rather than a random spin, when he looked into the northern sky. In the southern sky when he looked along that same axis, he found that 7 % of the galaxies lined up with a right handed spin. Spin comes from angular momentum. Angular momentum is like energy, it cannot be created. So if there is a small spin effect in our universe today, then the universe had to be born with that spin around an axis. The Big Bang demands uniformity and as such, it cannot explain where this spin axis came from. Astronomer and physicist Subir Sarkar of Oxford University summed up the discomfort that scientists feel with all these problematic observations. He told New Scientist that accounting for them all will make cosmology "too complicated". The real universe is thus too complex for our human theories to solve. Our mathematics is just not advanced enough to tackle the real world. It is safer to leave creation in the Hands of God. An explanation of the red shift of star light. If a vehicle with a siren travels towards you, the siren has a high pitch or frequency. It seems that the sound waves between you and the vehicle get compressed. When it passes you it has a lower pitch or frequency. The sound waves now seem to get stretched out by the moving vehicle. Most scientists assume that the universe is expanding. Their theory assumes that the space between clusters of galaxies stretches as time passes. Then the light waves that are coming from galaxies that appear to be moving away from us, will be stretched as the space between us and the distant galaxies stretches. This stretching makes the light waves longer, and longer wavelengths are redder. This is called the red shift of star light which astronomers observe. However it leaves us with the conceptual difficulty of trying to explain how empty space can stretch. Matter can stretch, for example blowing up a balloon that has got dots painted on it makes the dots move further apart, but how does emptiness ( nothingness ) stretch and expand? This also leaves us with the problem that there is no known mechanism to produce this "gravitational repulsion". So scientists invented the idea of Dark Energy. It is called Dark because we cannot contact it in any known way. We have no clue what Dark Energy is. Einstein said that space is curved by large planets and stars. Dr de Sitter, a famous astronomer, claimed that time can also then bend light. This extra bending will then stretch the light which will make the light redder. Then there is no need for an expanding universe. If the star on the right is moving away from the earth then the light waves will get stretched. A stretched light wave is longer and has a redder colour which has lower energy. Astronomers use red LED lights to see their telescope settings at night, as red light has too little energy to spoil their "night vision". If empty space somehow expands then the star will be pushed further away from the Earth, stretching the star light so that it becomes redder. If empty space contracts or shrinks then a star will be pulled closer to the Earth, compressing the star light which will make it more blue. Compressed blue light forms a shorter wave and has a higher energy. That is why blue lasers are usually banned as they can easily blind people. Blueray DVD lasers have more energy and can carry more information thus they form higher definition video pictures. When we heat up a solid object until it gets white hot, then a three sided glass prism can break up the white light into seven dominant colours changing from red to blue and violet, called a spectrum. When we look at white light that has traveled through a triangular piece of glass, called a prism, then we see this continuous colour spectrum with its rainbow colours. When white light passes through a cold gas, then certain colours get absorbed out of the spectrum by the cold gas. If we passed this spectrum of white light through a colder gas of sodium atoms, then two dark lines appear, looking like a barcode, where the sodium atoms absorbed some of the yellow colour. Only sodium atoms absorb these lines. So when this pattern of two dark lines appears in the colour spectrum, we know that sodium atoms are present between us and the source of white light. This specific barcode is unique to sodium. Each star is surrounded by an atmosphere that contains atoms of the elements that are in the star. In a laboratory, whenever we see these two dark spectral lines that are close together in the yellow part of the spectrum of the white light, we know that the white light has traveled through sodium atoms in the form of a gas. But when we look at white star light through a prism we see a slight change. The same two dark spectral lines appear that indicate the presence of sodium atoms in the atmosphere that surrounds the star. But the dark spectral lines are shifted towards the red part of the spectrum. This is called a redshift. In terms of the Doppler theory, the stretched out longer red waves of light indicate that the star is moving away from us. Scientists interpret this as saying that the quasar is moving away from us at a very high speed. Thus they claim that quasars must be the most distant objects that we observe, right on the edge of the observable universe. These conclusions depend on us blindly accepting that the red shift means that stars and quasars are moving away from us. But not all scientists believe in this theory. Astronomer Halton Arp photographed connected objects with very different red shifts. If they had very different speeds, they would no longer be connected. Halton Arp also photographed a quasar in front of a galaxy. So quasars are not that far away. This Quasar ( inside the ring that has been drawn ) is supposed to be 90 times further away from us than the galaxy behind it, according to their red shifts. 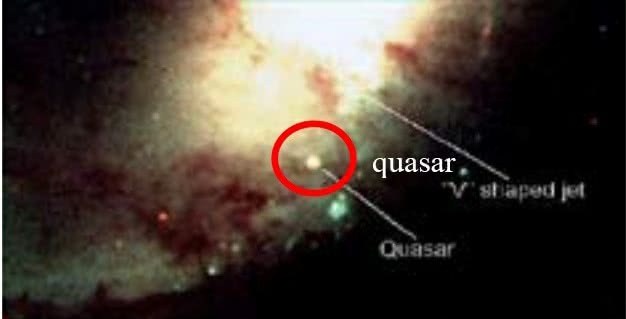 But the Quasar is in front of the galaxy and thus closer to us. This bright quasars has a huge red shift and so it is thought to be one of the most distant objects in the Universe. But it is not. The galaxy behind it would not be so bright if it were so far away. These facts do not fit into the theory of the expanding universe. So scientific theories can be very contentious. Steven Weinberg won the Nobel Prize for Physics in 1979 and remains one of the world's most respected physicists. In his classic and definitive book on the Big Bang explosion which he called "The First Three Minutes" he speaks, on page 28, of the increasing size of the universe. "I do not want to give the impression that everyone agrees with this interpretation of the red shift. We do not actually observe galaxies rushing away from us; all we are sure of is that the lines in their spectra are shifted to the red, i.e., toward longer wavelengths. There are eminent astronomers who doubt that the red shifts have anything to do with Doppler shifts or with an expansion of the universe. Halton Arp of the Hale Observatories, has emphasised the existence of groupings of galaxies in the sky in which some galaxies have very different red shift from the others". Thus not all the evidence agrees with the expansion of the Universe. "There is no consensus among experts on what quasars are or where they are". "Most cosmologists are persuaded that they are on the very rim of the seeable universe.... a small number of astronomers violently disagree. They think the quasars are so near that they are actually within the cluster of galaxies to which our Milky Way belongs.....Perhaps their red shifts are produced by colossal gravitational forces or by.... some other causes not yet known." "In 1971 astronomers found two radio sources, associated with a quasar, that seem to be separating from each other at more than nine times the speed of light!" This again indicates that the red shift is not due to objects moving away from us. There is no way that two objects can separate at that speed. We have discovered a lot of new physics in the last century : relativity, quasars, pulsars, black holes. We will discover a lot of new physics in the next century that we know nothing about at the moment. Maybe then we will be able to explain the quasars and the red shifts properly. Astronomers collected data on the planets for many centuries before Isaac Newton developed his theories that explained the motion of the planets. At the moment we should be collecting data on deep space, not rushing into explaining it all with our present incomplete theories that cannot explain all the facts. In future years there will be a far better theory available to work with. Scientists thought glow worms had little electric generators inside their bodies to make the light. Why did they think this? Because scientists only knew how to make a glowing light by using electric energy. Then, after many years they discovered how to mix two specific chemicals and make a light stick that glowed. So then their theory of the glow worm changed. Now they believe it makes light by using specific chemicals.